Even though I plan my meals, and shop from my list, I often am left with food that didn't get used. It is a common occurrence when you try to shop for an extended amount of time, like a week or two, or a month. There will be more in a package than what I need for a meal, or I will have food that is starting to not be so fresh, and needs used up before I lose it. So, I would say to live this way, you must be creative, and flexible in what you do. 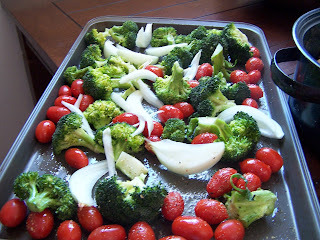 Better to change your planned meal, than to lose some produce that is starting to get wilted. I overbought broccoli and cherry tomatoes recently. We had a night out with family unexpectedly, so my planned meal didn't get served. We are very fond of oven roasted vegetables, so on my last turbo cooking day (see previous post), I cut up the broccoli and roasted it with the cherry tomatoes, and an onion that was threatening to go soft. I sprinkled them with Mrs. Dash garlic and herb seasoning, but could have just used italian herb blend, and salt and pepper, and drizzled them with 2 T olive oil. After tossing them to coat them all, I roasted them for 15-20 minutes in a 450 F oven. After cooling, they went in a sealed container in the fridge, for later in the week. On the day we ate it, I heated the vegetables and oil in a skillet, and tossed them with whole wheat pasta, and some Parmesan cheese. I could not find a small package of fresh white corn tortillas last time I shopped, so I was left with a substantial bunch of them, and no plan for their use. 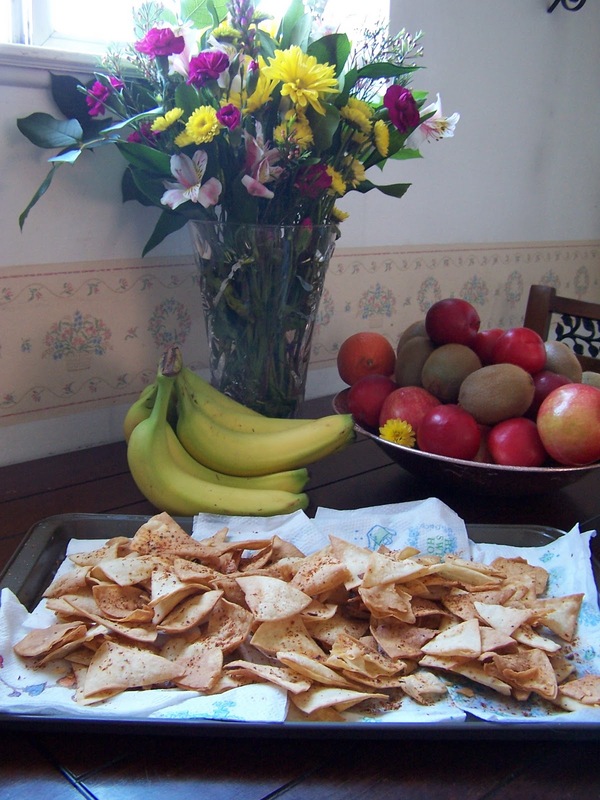 Today while the little babies napped, Bridger and I made homemade tortilla chips. We fried them in LARD and seasoned them with Tajin spice blend. If I didn't have that on hand, I could have just used salt, chili powder and some lime juice. Bridger's contribution was to oversee the operation, and do quality control on the chips cool enough to eat. He says they are pretty good, which is high praise from a two year old!